If a significant portion of the tooth has come loose, and broken, rinse it carefully under lukewarm water and bring it with you to our Coatesville practice. Reattachment might be possible. In the meantime, hold a cold compress over the appropriate cheek to reduce swelling. How to Deal with a Knocked Out Tooth? Do you still have the tooth? Rinse foreign debris off carefully leaving the natural tissue intact. Then, place it back into its original socket and hold it in place. If this isn’t possible, place the tooth in a cup of milk instead and bring it with you to our office. Time is of the essence, so hurry! Once you arrive, Dr. Simeone will work quickly to determine whether or not reattachment is possible. How to Treat Painful Toothache? Floss and rinse thoroughly. This should dislodge food particles or other pieces of debris causing the problem. If you’ve taken this step and the pain persists, contact Chester County Dental Arts to schedule an emergency appointment. Dental emergencies are stressful enough, so if you experience phobia surrounding a visit to the dentist, this added anxiety can be a little too much. Luckily, we offer effective sedation dentistry options to help any patient feel relaxed and free from pain in our office. Nitrous oxide “laughing gas” has long been used by dentists to help patients achieve the optimal level of relaxation in the dental office. This sedation dentistry option is ideal for almost any patient or treatment plan, but during a dental emergency, nitrous oxide can be especially helpful. The effects take hold quickly and the level of sedation can be continually adjusted to ensure you’re not in pain or experience unnecessary stress. Then, the nitrous oxide wears away just as quickly as it set in, so you can leave our office with a clear head and fully restored smile. What To Do In Case Of A Lost Crown? Apply a small amount of dental adhesive or toothpaste to the affected tooth and gently place the crown back into its original position. This should keep the vulnerable structure safe until we’re able to evaluate the crown and determine if it can be reattached. If you’re suffering from heavy oral bleeding or a possibly broken jaw, please proceed to your nearest emergency room for assistance. 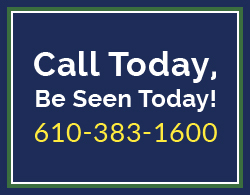 Our team at Chester County Dental Arts can assist you with any reconstructive needs after you’ve been treated. Please contact our office as soon as possible if you’re in need of emergency care! We are conveniently located on East Lincoln Highway in Thorndale at the old Kentucky Fried Chicken (KFC) building.